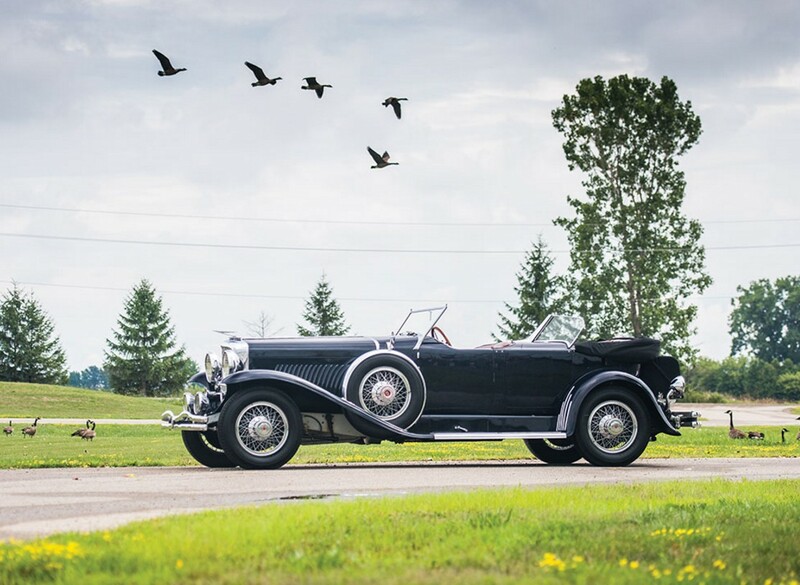 This Duesenberg Model J – which is beautifully photographed, despite the fact that geese are evil – is one of the more desirable body styles that was ever produced in a more-than-one-off quantity. The Dual Cowl Phaeton is one of the most interesting bodies you can have on an old touring car because it’s not something you can find and any new car. Anywhere. The second windshield provided some wind and weather protection for backseat passengers (and notice just how far back they really are). On this car, Murphy has actually angled the rear glass like the front, making the rear seat compartment look quite sporty if taken alone. And, as is the case with all Model Js, this car is powered by a 6.9-liter straight-eight making 265 horsepower. Murphy only built three Dual Cowl Phaetons and this is one of those cars. It is numbers matching from new (which is rare in itself). The car was restored in the early 1960s and has been maintained since. There’s an interesting history here, too: J-347 was sold new in Massachusetts but the owner moved to Mexico and in 1945, sold the car to a Mexican businessman. It was later featured in a film and then walled up in an airport parking garage by its next owner for years until being discovered and relocated to America. The same family has owned this car for 54 years meaning this will be the first time it has changed hands in the modern era. It’s a stunning design on an incredible chassis and should bring big money. Click here for more info and here for more from RM Sotheby’s. 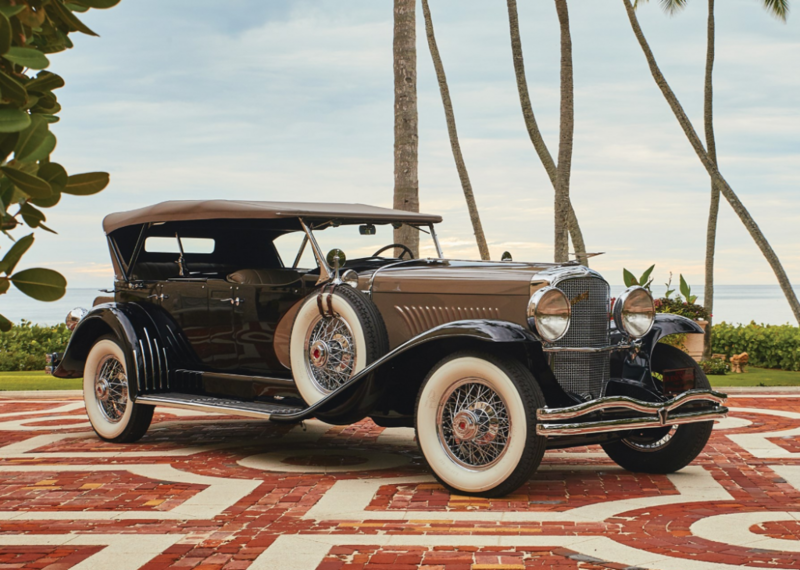 On December 1, 1928, Duesenberg debuted their new Model J at the New York Car Show. The car was an instant hit among those that could afford it. In the next year, the company built 200 examples before the stock market crashed and money dried up. Only a few hundred more were built before sales stopped in 1937. The standard engine is a 6.9-liter straight-eight making 265 horsepower. This particular car was originally bodied by Rollston in limousine form. 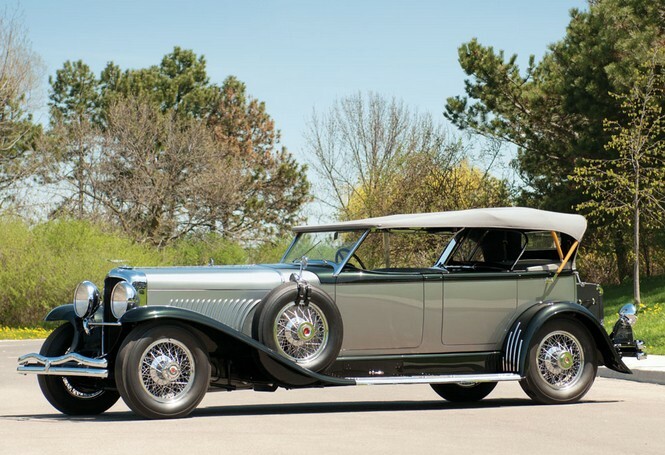 A few years after it was new, the body was swapped for a Dietrich Convertible Sedan. That body was lost in a fire. In the 1970s, the car was restored and the current body – which was scratch-built in the style of the famous LaGrande Dual Cowl Phaeton. A supercharger was also added, upgrading the car to SJ specification (meaning 320 horsepower). It’s not an original SJ, but it is an original Model J chassis and engine. It’s very nice and you can read more here and see more from Mecum here. Update: Not sold, Mecum Monterey 2015, high bid of $550,000. Update: Sold, Mecum Monterey 2016, $600,000. Update: Not sold, Mecum Monterey 2017, high bid of $550,000. I’ll put this as simply as possible: Duesenbergs don’t get much better than this. Reason #1: this baby is supercharged. Reason #2: this is the best (my favorite) body style you can get. The body, the LaGrande Dual Cowl Phaeton, was an updated version of the LeBaron Dual Cowl Phaeton. The updates were done by none other than legendary designer Gordon Buehrig. This is a factory-spec Model SJ – so it’s not a Model J that was upgraded years later. That’s pretty exciting. The engine is the standard 6.9-liter straight-eight that’s been supercharged to put out 320 horsepower. This is the original chassis and engine but the body was swapped with another car. Both of these cars simply wear each others bodies to this day. The present owner bought this in 1978 after the current restoration had been completed. It has recently been serviced to running and driving condition. This is one of four LaGrande Dual Cowl Phaetons attached to a supercharged engine and one of the final of the kind built. It’s an awesome opportunity and should bring in between $1,500,000-$2,000,000. Click here for more info and here for the rest of this auctions’ lineup. Replicas. Some people love them, just as many people loathe them. Shelby Cobra replicas outnumber original Cobras by what has to be at least 100-1. All of E.L. Cord’s highlights from the 1930s were re-produced years later. Auburn Speedsters, Cord 812s, and the legendary Duesenberg Model J. The Auburns and Cords look similar, but they aren’t convincing as originals. I think what holds them back is that they have modern tires on them. Not so here – these are correct 19-inch wire wheels with whitewalls. And they sell the whole package. Nothing here seems out of the ordinary until you look under the hood where a 7.5-liter Ford V-8 sits. 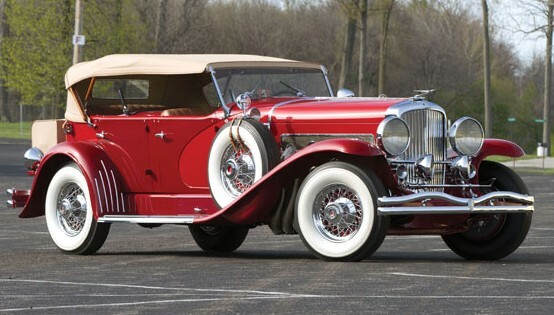 There have been a couple of attempts to revive Duesenberg, one of America’s most prestigious manufacturers. 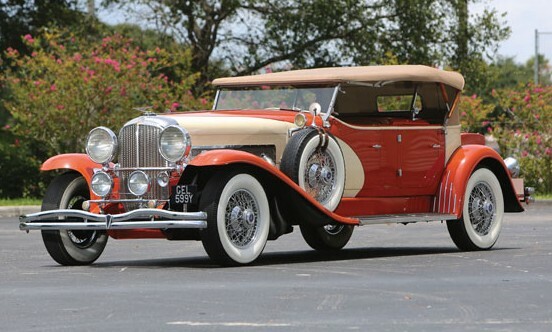 August Duesenberg’s son attempted it in the 1960s (and the car sort of became the 1970s Stutz Bearcat). There were a few awkward sedans built in the 70s called Duesenbergs. 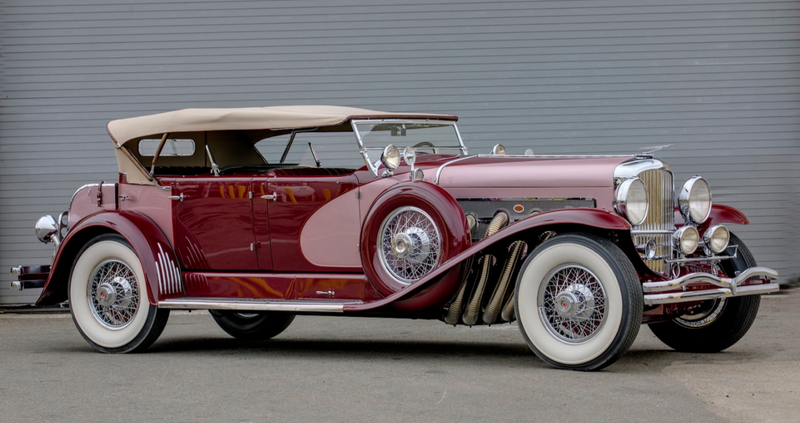 The Duesenberg II was the most successful, produced between 1978 and as late as 2000 by Elite Heritage Motors Corp. of Elroy, Wisconsin. 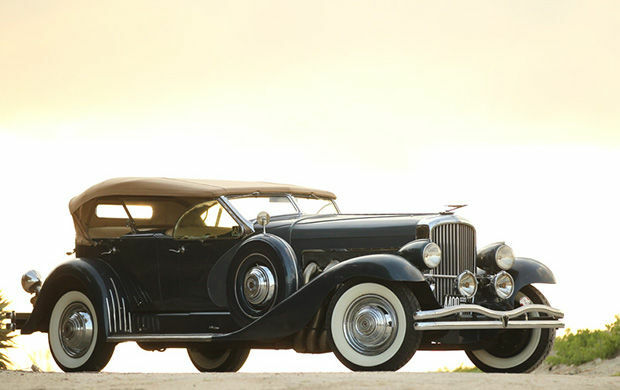 They offered five different bodies that you could’ve gotten back in the 30s – this Dual Cowl Phaeton one of them. When they were built, prices for these “new Duesenbergs” went up to $225,000. That’s pretty expensive for a replica. But these cars have modern conveniences and look absolutely stunning and authentic. Very few people can afford a real Model J, but you can get the same feeling for a lot less with this thing. Replicas aren’t something we’ll normally feature here, but this seems more legitimate than most. Plus, they’re far rarer than the real thing, with less than 100 built. You can buy this one for an estimated $200,000-$240,000. Click here for more info and here for more from this sale. Update: Not sold, high bid of $147,500. This Model J is an actual Model J but it doesn’t have an original body on it. The original body, which was a Derham Town Car, burned to the ground. 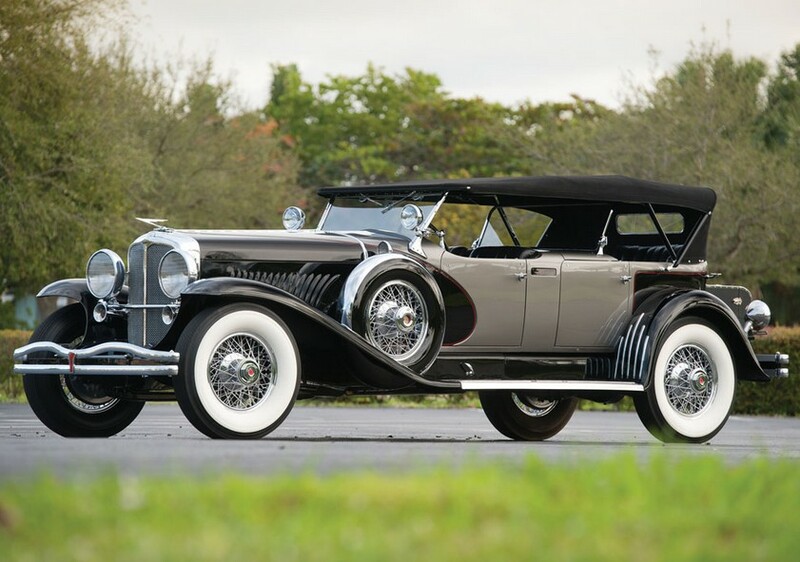 At some point more recently, the car was restored and given a Dual-Cowl Phaeton body in the style of Murphy. But between that time is where this car’s interesting history lies. James Hoe was a mechanic who is more or less responsible for keeping many of the Duesenbergs still around alive and well. He worked on them back in the day, servicing, repairing, etc. Whatever kept them around. Well in 1950, he bought this car for $150 – basically salvaging it. The body was a loss, so he turned it into a custom speedster. 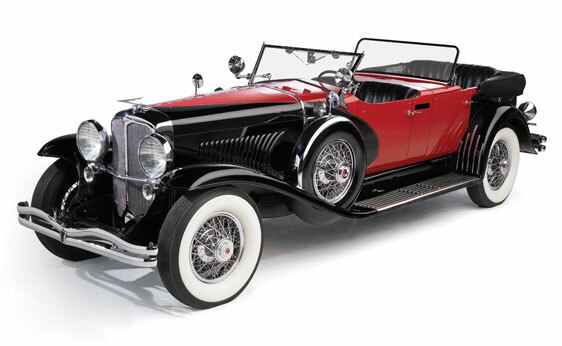 Many of the original Duesenberg parts were still on it, engine included (although the transmission was from a White truck). He raced the car at some SCCA events and hillclimbs. It would do 140 mph. After he sold it, the car was restored to how you see it. A different engine was put in the car, but the bell housing from J-183 was retained and that is the number the engine carries today. It should sell for between $725,000-$900,000. Click here for more info and here for more from RM at St. John’s. 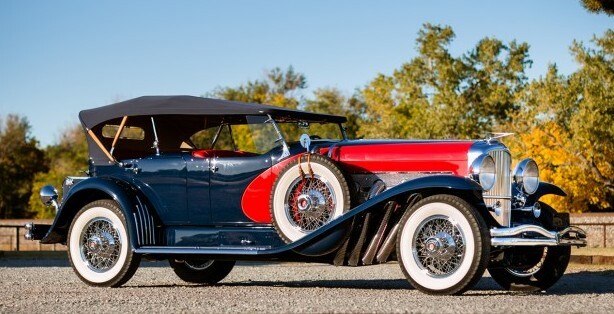 We somehow missed featuring this Duesenberg during the hype and excitement leading up to the auctions in Arizona in January. And since one of my goals here is to feature every Model J that comes up for sale, here it is. This is actually my favorite bodystyle – the LeBaron Dual Cowl Phaeton. It is also the coachwork most commonly associated with the Model J. 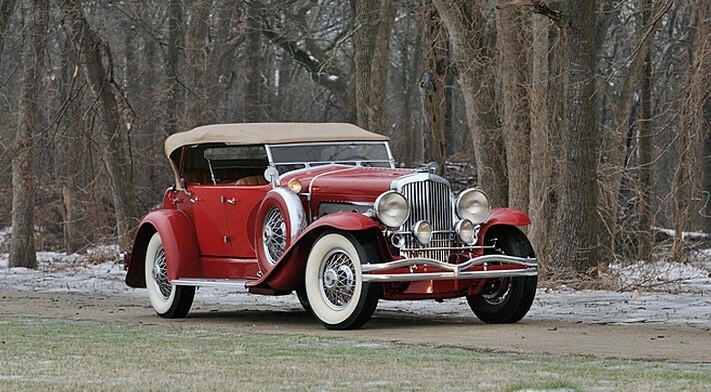 And this is the only long-wheelbase Dual Cowl Phaeton built by LeBaron and it is the original body. The engine, however, is not. When this car was delivered to a Mr. J. Clarke Dean of Chicago, Illinois in 1930, it had engine J-320 under the hood. The second owner discovered, in 1948, that the engine had been replaced with J-487 – an engine with no known previous history in another car. As always, the straight-8 makes 265 horsepower. The sweep panel two-tone paint scheme is also my favorite. Black and red is the most common I’ve seen although most combinations are attractive (green and black is how I will have mine, please). LeGrande also built sweep panel Dual Cowl Phaetons that looked more or less the same. The way to tell the difference is that, on a LeGrande, the sweep of color extends farther down, halfway through the door. This car was estimated between $900,000-$1,200,000. 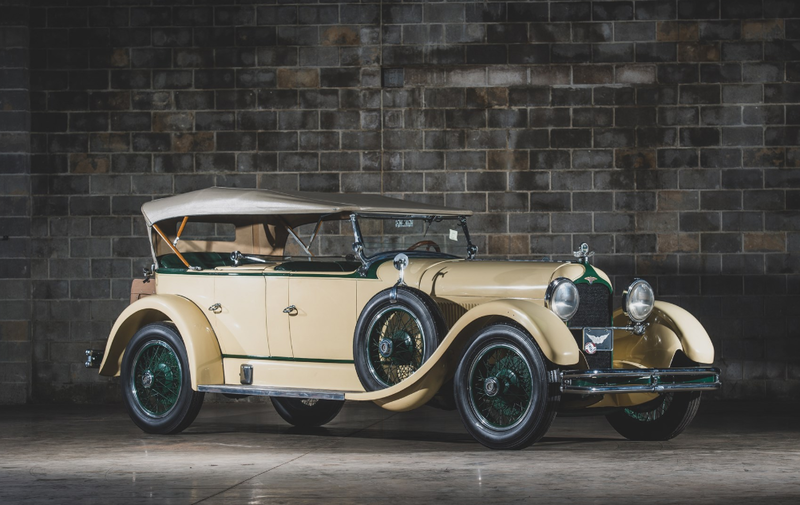 With this desirable, original coachwork, known history and coming from the John O’Quinn collection, it is definitely worth that. It sold for $880,000. Well bought. To read the complete catalog description, click here.